Tottenham Hotspur Football Club, commonly referred to as Spurs, is an English football club based in Tottenham, London, that plays in the Premier League. The club's home stadium is White Hart Lane. How do you pick a club? Well i look for clubs that are not the best in there respected league and try to make them exactly that. 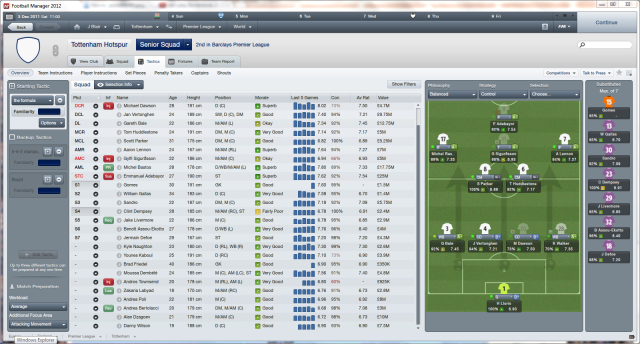 So i picked the Yids. 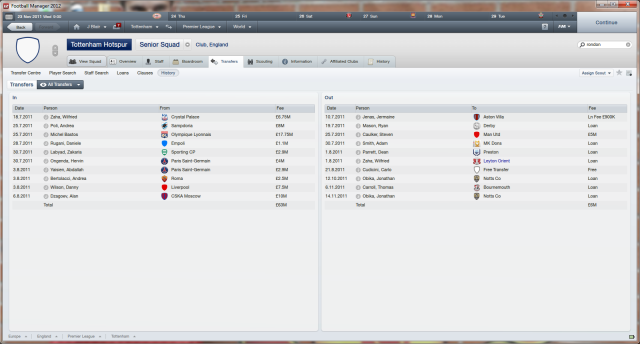 So i get the Job with 28,500 and expires at the end of the 2012/2013 season. And straight away got All the facility's upgraded. Then asked for Wage and transfer budgets increased. So as you can see i bought alot of high potental players but i was happiest with Danny Wilson he is goin to be a great player. I wasn't that impressed with it, the HSV result was shocking but i was satisfied with the Athletico Madrid game but that's about it. The next post will be in the next week with the game in march with all the transfer and game results. Well the 2011/2012 season has just finished and i think it has been a great year for Tottenham with 3 trophy's in the cabinet. 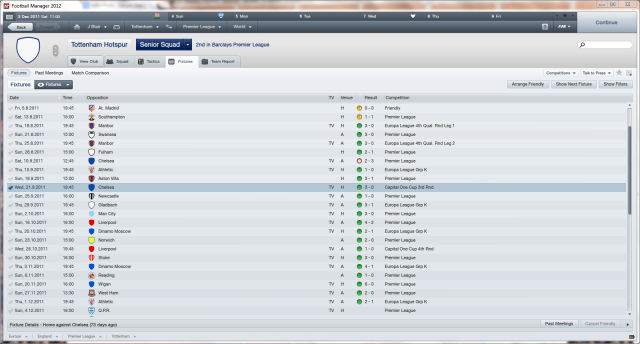 I came 3rd in the league behind the two Manchetser clubs. United were just to good with RVP and Rooney up front. 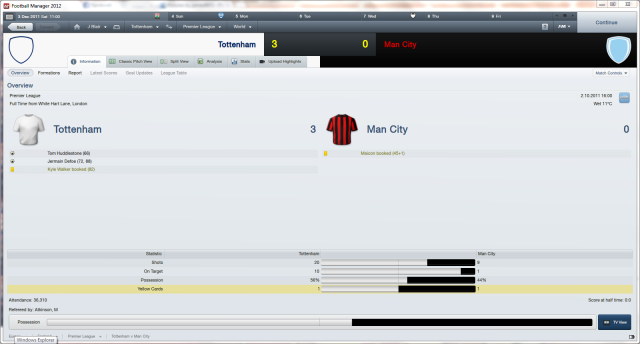 but despite that i won The Capital One Cup, The FA Cup and the one i most cherish The Europa Cup. What a great year he had with 42 goals in 52 games best striker by far. This young lad is quite the player his stats are amazing and with 25 assists he was injured for 3 months i hope next year he can stay helthy. So that's the year in my save next update will in the next week and itll show my game up until the end of the transfer window. So this takes a bit of doing 2 hrs for thios post and the game itself so if you could promote it or even offer some constructive input that would be great. Please Vote for the next team i should post about? 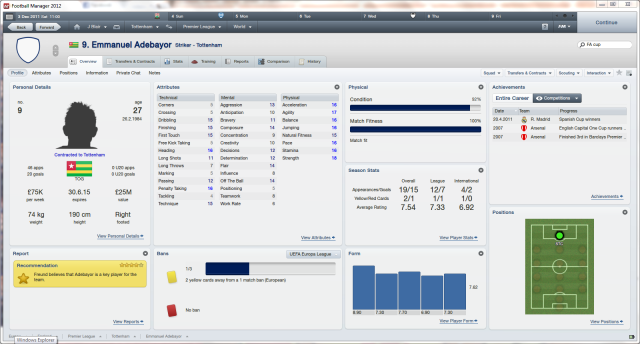 Brilliant season there, Adebeyor is tremendous on FM, and would walk into any team in the game. So, next stop Russia ?